Working with humans as a facilitator could be presumed to be in-person, or perhaps online. Basically, in ‘real time’. But it can also be asynchronous, creating an exchange across days, months, even decades or centuries. How you can write about facilitation in ways that help others? Ideally in a practical and engaging way? “A shared characteristic [...] appears to be that of mutual commitment and responsibility. Khorshed Bhote and I had that day each brought a text along that we were looking to develop further. Ultimately our aim was to engage with the texts in a deeper and more meaningful way than we might on our own. 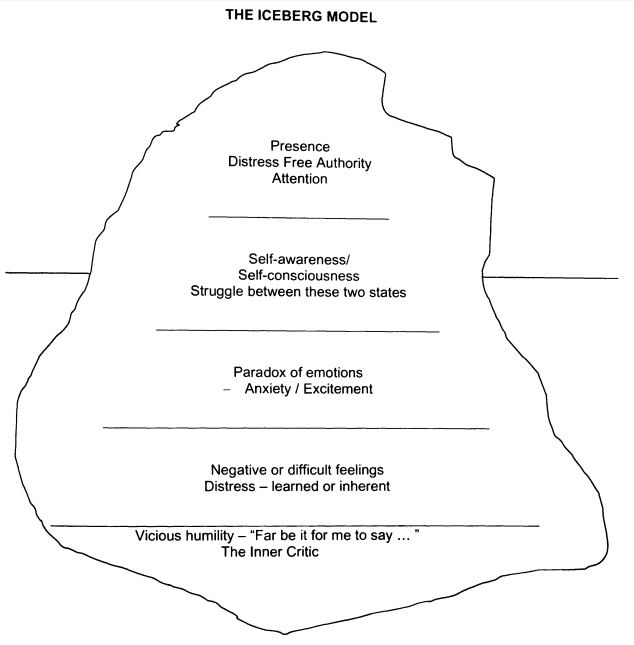 Steve Dilworth (the other co-facilitator on the day) developed ‘the iceberg model’ in 2008 that neatly captures the layers of challenge and conflict that can exist within oneself - layers Critical Friends can arguably help each other to navigate. Here’s a brief summary of how we structured our mutually supportive discussion. Ground rules. First of all we agreed some basic ground rules. In the literature this is known as the Critical Friend contract. We asserted our shared intent to be constructive, curious and positive. Clarity of intent. It is helpful to know what you're reacting to as a critical friend. Writing can go in lots of directions, and understanding the intent and aim is helpful. To that end we shared what the objective of our respective articles were. And the audience we had in mind. Including accessibility and the importance of plain English. Both of us wanted to make it accessible and easy to read. We both had fellow facilitators, and others interested in facilitation, in mind. Call to action. We also talked about what we were hoping the reader might do next. Our initial hope was to help generate some reflection, and then prompt action: inspiring others to write about facilitation too. And with that timely nudge: the next issue of IAF Global Flipchart is about Facilitation as a career - and the deadline for contributions is 10 November 2018. Tone of voice. We then discussed the kind of Tone of Voice we had in mind (rather than what might actually be on the paper). Basically how the text will sound to people reading it. Those who are well-versed in the facilitation methodology known as the Technology of Participation will recognise that the above is an espresso shorthand of a full-fledged ORID conversation. Review. And then, only then, did we swap texts, read away, and mark up! The end-result result? A well-reviewed article in the Journal of the Association for Management Education and Development - of which this is a brief summary. Read the full issue for lots more on writing about facilitation to help others. Thanks to Steve Dilworth and Bob MacKenzie for co-facilitating the AMED Writers’ Group workshop. Khorshed Bote for her Critical Friendship - and Martin Gilbraith for suggesting I attend the session in the first place.